These collections of fiction readers are designed to stimulate students' interest about the world, broaden their reading experiences, and enrich their vocabularies. Students are introduced to a range of genres, including realistic fiction, historical fiction, adventure, poetry, science fiction, humor, diaries, journals, traditional stories, fables, fairy tales, biographies, and autobiographies. 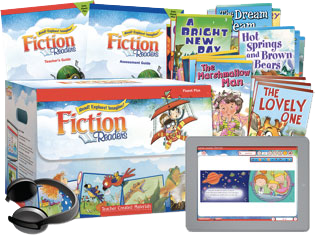 Engage beginning readers with colorful books (15 titles in each kit, 6 copies each) in print and digital formats. Access PDFs of books, teacher resources, student activity sheets, supplemental images, audio, and video digital resources. Track progress with series placement tests and formative and summative assessments in the Assessment Guide. Create a blended learning experience with Interactiv-eBooks featuring two activities per text (one comprehension and one writing). Model fluent reading with professional audio recordings of books and included Reader's Theater scripts.